Let me begin by wishing you and your loved ones Happy Holidays! Whatever you celebrate, I hope your bellies, livers and hearts are full of their respective contents. While I still tend to drink and be extra merry on the 25th, I do find myself to be more exhausted than jolly, as I tend to work longer hours and stress over perfect gift giving weeks prior, all while attending multiple Secret Santa parties. My sincerest apologies for any display of Grinch-like personality traits, evil smile and all. 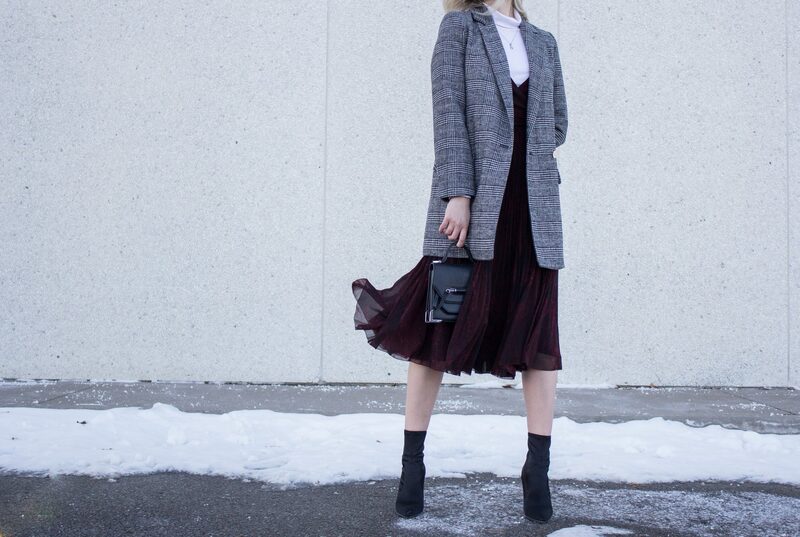 This year, I chose to work with one of my favourite FW trends: turtleneck and dress combo. Due to the conservative nature of the turtleneck and the below-the-knee length, I appreciate this outfit for being appropriate across all events, whether you will be surrounded by family (Yes, Grandma, I see you), business associates, or friends, while still displaying your festive and fun side (Automatic camouflage of spilled red wine is an added bonus). The egg-shell white turtleneck and tailored checkered blazer is both for purposes of contrast and warmth, while the wrap dress, and its permanent pleats, provide a flattering and flirty fit. Don’t forget to pair with minimal jewelry, natural make-up, waves (or low bun), and black sock boots, for a sophisticated and sleek look (In hindsight, self-tanner is an option too). So, do I have my sh*t together? Clearly not. Can I still rock a holiday outfit while secretly trying to remember if I took the price tag off the wrapped gift that I am about to give? Definitely. Lastly, feel free to carry this look into the new year, whether a low-key NYE party or January birthdays. Love it. I probably would of styled this dress exactly the way you did, with a red bag perhaps. Just because I like mixing burgundy and red. Your outfit is perfect. You are totally right! Red crossbody or even oversized would have been a great addition. Good eye 😊. Wishing you a great weekend!